That third area, Zi, features a number of steam vents as obstacles. Each little puff of vapor comes with a sound effect. That sound effect is apparently missing from the Epic store version. So when you enter the area, the game tries to play the sound, and in want of a missing file the game crashes. The bug’s been reported on Twitter and the game’s official subreddit – more than once. ResetEra users have dug through error logs and game files to confirm that it is indeed the missing “steam.xnb” file that’s causing the crash. 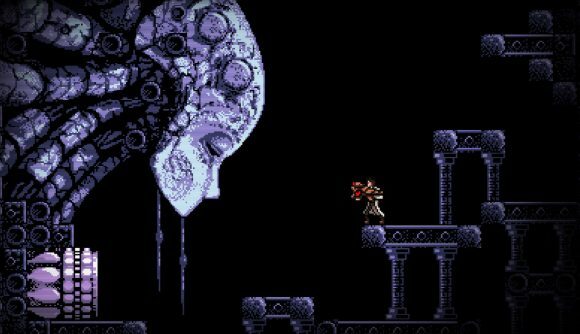 We’ve reached out to the Axiom Verge developer to find out more about what happened. The fix is out now, so if your game is up to date you should be fine. Regardless, it’s still hilarious. I’m going to take this opportunity to say that Axiom Verge is one of my absolute favourite indie games and I don’t think there’s a finer take on the Metroidvania out there. Hopefully this bug gets fixed soon – you know, after we’ve all had a chance to laugh about it.